I have to tell you, this was my very first attempt at making any kind of homemade pasta ( unless pierogie count) ...and I was really happy with the results! These potato gnocchi are super easy to make and really, who doesn't love fresh pasta? A bit high on the points+, but worth the splurge. They are light and not heavy like some store bought gnocchi I have tried. 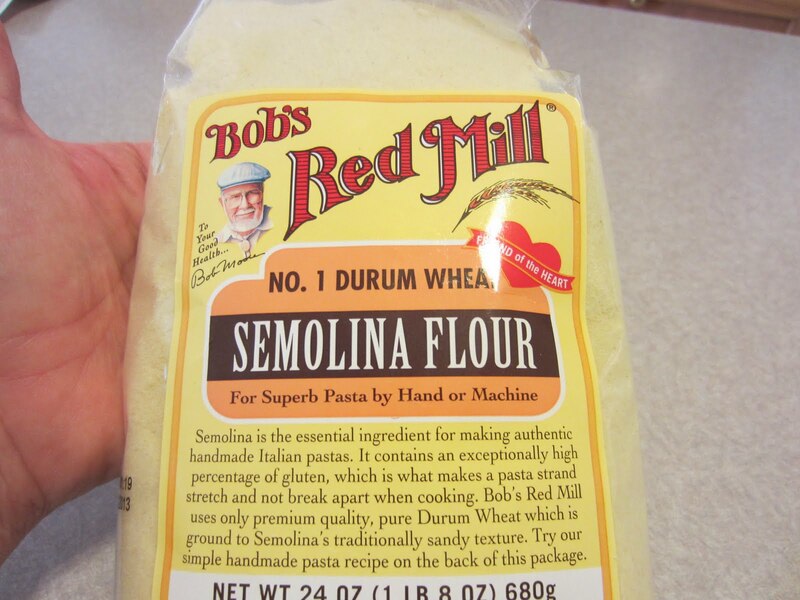 The secret might be using semolina flour instead of all purpose flour which can be found in the baking section of your supermarket. If you can't find semolina flour, you can substitute all purpose. If you serve them with a good 1 point+ sauce like Basic Tomato Sauce Two Ways and a veggie side salad you can help keep the meal in check for points. You can also increase the serving size from 4 to 6 to decrease the point+ values, but if you are serving this as a main dish and not a side dish, I suggest going with the 4 servings. The first thing you will need to do is get some Yukon gold potatoes. I chose to use Yukon gold because they have a really nice texture and a buttery flavor. I did boil up 7, but ended up electing to use only 6 in the pasta, after I calculated up the points+ values of the dish. You will need to GENTLY simmer these potatoes just until they are fork tender. ( they need to be tender enough to go through the ricer, but not mushy and holding a ton of water.) The water below is actually at the right amount of simmer. Next, I peeled the potatoes and riced them in a ricer. If you don't have a ricer, you could just mash them really well with a potato masher or fork. I divided the soft dough into three pieces, making sure to cover the dough I wasn't working with in the bowl so it didn't dry out. 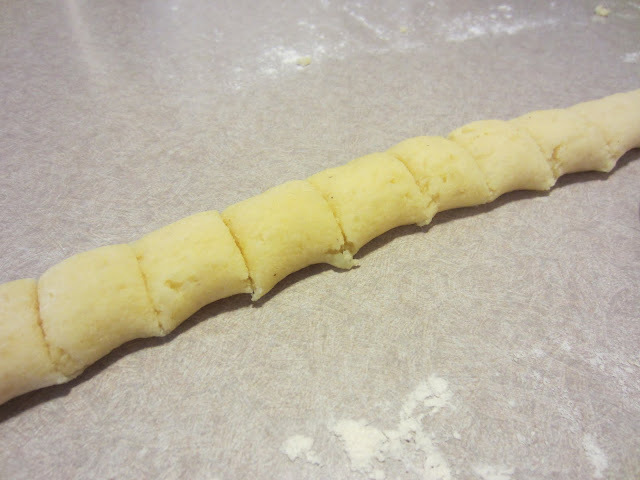 Then I formed the dough piece into a super long ( it really was long!) rope about a 1/2" thick and then cut it into 1/2" pieces. As I finished with each gnocchi, I placed it on a pan that was dusted with flour to help keep them from sticking. When I was done making all the gnocchi, I got a nice big pot of salted water boiling, and dropped the gnocchi in one at a time. I cooked them until they all floated to the top, about 3 - 5 minutes. That is how easy it is to make gnocchi! I will be making these again, but I think I might play around with seasoning the dough with different herbs and spices next time. I will also be working to try to decrease the overall point+ value of the dish, although with the double carb bomb of potato and flour...not sure much can be done there. I have seen gnocchi made with ricotta cheese and I would like to try that sometime too! Somethings are just meant to be enjoyed in moderation, and I think this is one of them! 1. Scrub potatoes and place them in large pot of salted water. 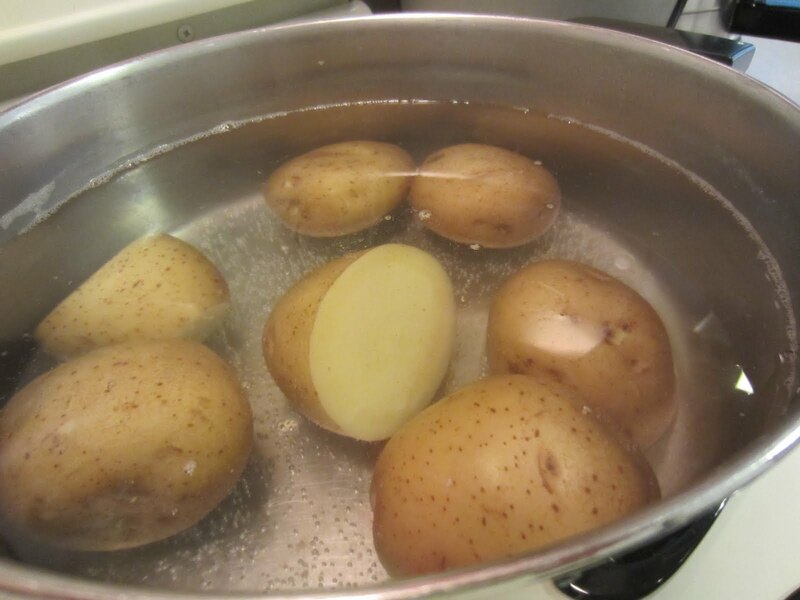 Gently boil/simmer until potatoes are fork tender. Do not cook them until they are mushy. Gently cooking them will allow you better control over how much they cook. 2. Drain and peel potatoes and put through ricer. If you don't have a ricer, mash with fork or potato masher until potatoes are well mashed. Add in egg, olive oil, 1/2 tsp. salt and pepper. Mix until smooth. 3. Add in flour, starting with a bit less then one cup and add more flour as needed to achieve a nice soft dough. ( not sticky ) I ended up using just shy of one cup. Knead soft dough with hands until it is smooth. 4. Divide dough up into three sections. Take one section and on lightly floured surface, gently roll into a 1/2" diameter rope. Cut rope into 1/2" pieces. Take back of fork and run each gnocchi over to achieve marks. ( optional) Place gnocchi on lightly floured pan and repeat with the rest of the dough, until all gnocchi are made. 5. Bring large pot of salted water to boil. Drop in gnocchi one at a time into boiling water. Cook until they float to the top, about 3 - 5 minutes. Drain and serve with sauce of choice. Garnish as desired with Parmesan cheese, fresh basil and fresh ground pepper. Luckily, I was spot on with my points yesterday and I had enough left to enjoy this for dinner, with even a few left over for a sweet treat too! I had a coupon for one of those new Skinny Cow candy bars I cashed in at the store this week. I choose the "heavenly crisp bar with peanut butter creme". Verdict? small...but tasty. Really tasty! the chocolate tastes wonderfully creamy as does the peanut butter filling. They don't taste lightened up or fake in any way. They come in at 3 points+ per bar. I don't know if I would say they are the answer to candy cravings, as most fun sized bars of real deal candy bars are also 3 point+ and size wise these are similar, but I would say these bars stand on their own as another choice for candy cravings. A winner will be chosen for the GOYA giveaway tomorrow...so if you are interested in a chance to win those cute recipe booklets, make sure you stop by HERE and leave a comment or two! I've always wanted to try making gnocchi. I just assumed it was incredibly hard. Thanks for the recipe and description. I'm going to do this! I love homemade gnocchi - I just made sweet potato gnocchi a couple weeks ago - totally worth the points! I'm Italian and gnocchi is my all time favorite dish. I love it with a pink sauce with pancetta. I can't remember the last time I had it though, because of it's high PP value. I look forward to making this! I've only tried potato gnocchi once; going to have to give it a whirl again! I have never made or tried gnocchi! This recipe is pretty simple, so why does it scare me? You did a fabulous job. Hope to see you and your tasty goodness next week. Your Potato Gnocchi looks perfect. I can almost taste these special treats. Great tutorial! Hope you are having a great week end and thank you so much for sharing with Full Plate Thursday! I think I could eat gnocchi every single week!